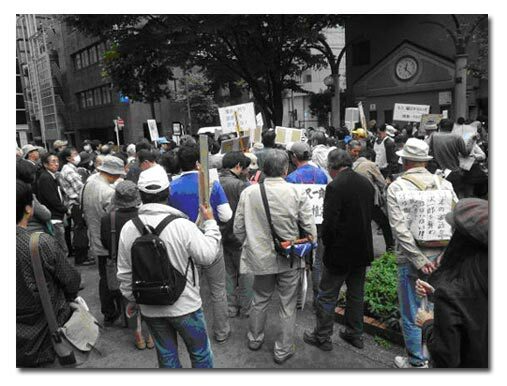 On October 24th, a massive demonstration was staged in Tokyo against prosecutors’ office & main stream media. It was the first large scale demonstration by calling for on internet and Twitter in Japan. 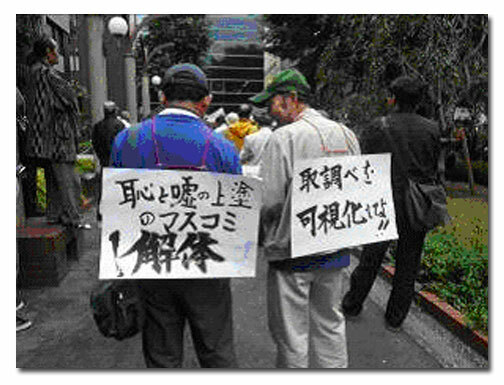 “A kind of fascistization is in progress, and democracy in Japan is now in danger”, “Mass media reports are too extraordinary. They hide the truth and manipulate the information intentionally”, participants replied to the reporter of APF News. 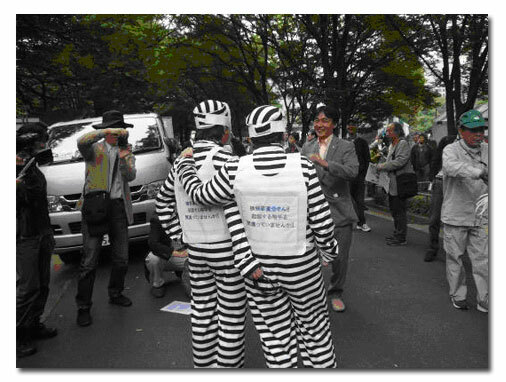 Since Tokyo district prosecutors’ office commenced the investigation against the then opposition DPJ leader Mr. Ozawa Ichiro in 2009, simultaneously mass media started engaging in the negative campaign to reformist Ozawa as if they were following the political intention of the then LDP government to trap him to end his political career. On September 10th, Osaka district court found the high rank government officer Ms. Muraki Atsuko who had been arrested and sued by Osaka district prosecutors’ office not guilty. Shortly after this, it was turned out that one prosecutor in charge of the investigation had fabricated the data of the floppy disk which had been seized as the material evidence so that it would fit the story line of the prosecutors’ side. In this case it is told that the main target of the prosecutors’ office was not Ms. Muraki, but another DPJ lawmaker Mr. Ishii Hajime. Mr. Ishii had an alibi and prosecutors’ office sued Ms. Muraki but was not able to sue Mr. Ishii. Soon after the fabrication case was turned out, supreme prosecutors’ office arrested the alleged prosecutor Mr. Maeda Tsunehiko and his seniors. Mr. Maeda engaged in the investigation to Mr. Ookubo Takanori who was former secretary of Mr. Ozawa and had been arrested by the Tokyo district prosecutors’ office. It is pointed that police officers and prosecutors often use the high-pressure method such as threatening and giving mental torture in the closed door interrogation, and force witnesses and suspects to sign the documents written by prosecutor side. In Mr. Ozawa’s case, Tokyo district prosecutors’ office arrested Ozawa’s secretaries regarding the political fund report of Mr. Ozawa, however some legal experts pointed that they are innocent. Prosecutors’ office investigated Mr. Ozawa as well but prosecutors were not able to find any evidence to sue him. However a self-claimed “citizen group” used the system of Office & Committees for the Inquest of Prosecution (OCIP) which is able to check the case that has been dropped by prosecutors. Committee members are told to be chosen from the nationals by lot and members’ identities are not open to public. Committee members will have closed-door discussion with help from an assigned lawyer and if they judged it is worth indicting, they have power to indict despite the conclusion of Prosecutors’ Office. Many legal experts pointed out that it is impossible to indict Mr. Ozawa, however the committee members have judged to indict him. And it was turned out that the committee had added another charge which must not be included in their discussion to their verdict. It is pointed out that the verdict itself is not valid legally. It is suspected that the assigned lawyer might have misled the committee members from the certain intention. Regardless of those suspicions in the investigation of Prosecutors’ Office and the verdict of the OCIP, mass media still continues harsh Ozawa-bashing requesting him to resign from Diet with neglecting the principle of assumed innocence. Public distrust in prosecutors’ office and mass media increased sharply. Soon after the verdict of the OCIP was open to public, many angered people insisted to have demonstration on internet and twitter spontaneously. Mr. Yano Kenichiro decided to be an organizer and to report the demonstration to police, and sent the information using twitter. Some people contacted Mr. Yano voluntarily and they set up the citizen group to organize the demonstration on October 24th in Tokyo, and spread the information by twitter and internet. Many bloggers, internet users and Twitter users cooperated to spread the information widely and quickly. 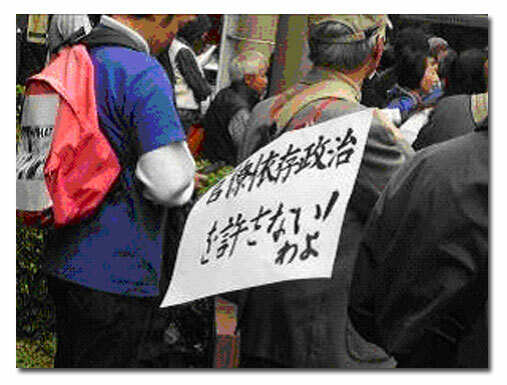 This is the first demonstration called for by internet in Japan. Participants who had never met each other directly before gathered on the day. And they marched the centre of capital city Tokyo together chanting the same slogans. And several participants broadcast the demonstration live on internet. On the day, APF News and some free individual journalists came to report this epoch-making demonstration. However the main stream news media which are continuing the wanton Ozawa-bashing never reported about the demonstration as if it had never occurred. In Japan people gradually started suspecting the uniformed media reports, and started calling for a boycott of the major newspapers and protesting to the sponsor companies of the biased TV programmes. As a matter of course, the main stream media never report those anti mass media movement. Internet media is gradually becoming the alternative information source for the people. This entry was posted in デモ情報, ファシズム, マスコミ問題, 社会, October 2010, 偏向報道, 政治, 政治・時事問題, 日本, 日本社会, 書籍・映画, 民主主義 and tagged 24 October, biased, democracy, demonstration, internet demonstration, japan, japanese politics, mass-media, media, politics, prosecutors, protest, society. Bookmark the permalink.